There is something very cathartic about the creation of a cake. Regular bakers will testify that baking is like a form of therapy; good for the mind and soul. As you tie your apron around your waist, prepare all of your ingredients and roll your sleeves up, you are instantly transported into a world where your main focus is to transform the instructions that lie before you into a delicious creation. A mode of creative expression, baking is a release, a form of concentration and engagement with a process. An act of mindfulness, in which you are fully invested in the outcome of the task at hand. The reward at the end of the process also helps to instill happy thoughts as you purposefully immerse yourself in the sight, smell and taste of whatever delicacy you have chosen to bake. 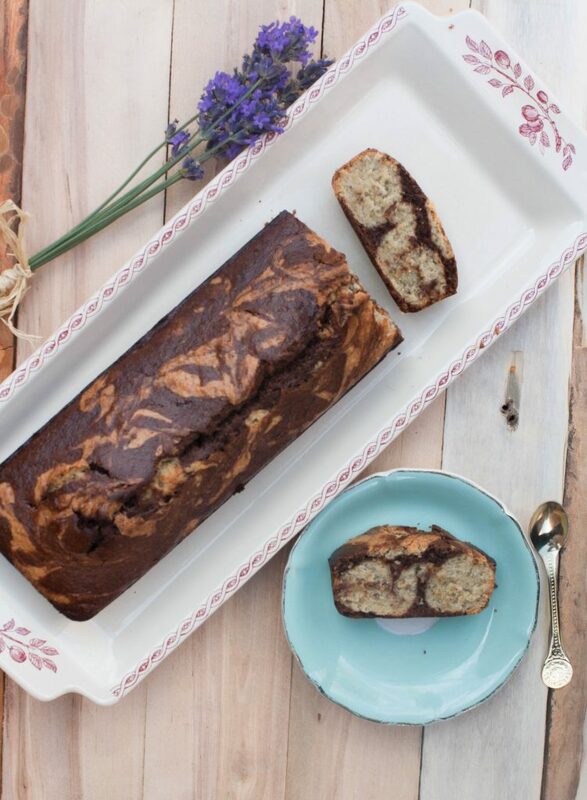 A baker who knows a great deal about the therapeutic benefits of cake making is Mimie, originally from France and now residing in London Town, she wants to share her love of baking, precisely her love for French vegan desserts, and teach others her simple and nourishing recipes. A form of meditation for Mimie, the kitchen represents the sweet world of pastry, a place where negativity and worry are not permitted. Her dairy-free, refined sugar-free and mostly gluten-free recipes are 100% soul food; good for the mind and body, inside and out. From the simple crêpe, to the light mousse au chocolat and the delicate mille-feuille, Mimie hopes to inspire you to try and recreate her favourite French pastries, inspired by her childhood memories. We had the pleasure of speaking with her about her love of baking, who taught her the ticks of the trade and why her bakes are delicious and nutritious. Mimie also shares two mouth-watering recipes - her chocolate and coffee marble cake and her signature waffle recipe (both vegan and gluten-free). Where did your love for baking originate? My love for baking started at a very young age, I remember Sunday mornings spent with my mum baking. We would make fruity tarts in the summer and ‘comfy’ treats such as chocolate cake in the winter. While I was at University, even though all my free time was dedicated to my studies I would always try and find some time to bake, even if it was just a small batch of cookies. Baking acts as a sort of therapy for me, it helps me relax and be in the present moment. How does mental wellbeing play into your baking? Mental wellbeing and baking are so interconnected to me. Creating a recipe allows my mind to slow down, it is a form of meditation as I become very mindful of everything I do, losing myself into the present moment. I put my apron on, get the ingredients ready, leaving all my worries outside the kitchen. The simple fact of thinking about what I will create next brings me a sense of calm. How is baking good for the soul? Baking is an act of creation as well as an act of sharing what you have created with your loved ones. Creating and sharing make you feel at peace and I find this feeling through baking. Imagining a recipe and seeing it come into life brings me so much joy. They are many times when a recipe doesn’t come out the way I thought it would but I never get upset about it and try and figure out what went wrong and how I could make it better next time. When I am baking I am very patient and kind to myself which is something I often find difficult to apply into other aspect of my life. As a child I loved going into the sweet sections of my mum’s cookbooks and devour the photographs with my eyes before begging her to let me make one of those beautiful cakes. She would always say yes and under her supervision I would bake our Sunday treat. My mum and her cookbooks initiated my love for baking. Later on, after I graduated and decided that baking is something I wanted to do for a living, I took a course by chef Fran Costigan on plant-based baking as I was also very conscious about the impact that food can have on our health. Bringing my two passions together: baking and nutrition. How would you describe your recipes? My recipes are like sweet childhood memories to me. They are comforting recipes such as the gooey and warm chocolate fondant that my mum used to make on a cold winter afternoon, or my dad’ soft and spongy apple cake. My goal is to bring back our cherished recipes and adapt them to our needs. I believe that the way we eat and the way we feel are interconnected, and rather than depriving ourselves from the food we love I prefer to make some tweaks to it so that even the naughtiest desserts contribute to feed both our mind and body. With Mimie’s Delicacies I bring back my favourite desserts without eggs, milk and butter, which is a fun challenge when one knows how much dairy goes into French Patisseries. How does your French heritage shape your baking? In most French families, cooking/baking and eating at the table sharing some delicious and simple food is essential and is what brings the family together. I don’t remember of a Sunday without a cake in the oven and the entire house smelling wonderful. This act of sharing has stayed with me and this is why I am so passionate about sharing my recipes now. After college I decided to travel rather than start University like most of my friends were doing, simply because I had no idea what to do and I also really wanted to learn a new language. I went to Spain for a year where I worked as a European volunteer teaching French. After a year of learning a new language and discovering a new culture, I wasn’t ready to come back home and followed my boyfriend at the time who was coming back to his country, England. I didn’t speak a word of English and even though we broke up after a few months I decided to stay and learn English. After a couple of years, I started University in London, finally knowing what it was that I wanted to study (linguistic and communication). During which time my passion for baking and creating recipes grew bigger and bigger, to the point of wanting it to be my full-time job. I am now selling my bakes at Soho Vegan Market and creating recipes every week which I share on my blog mimiesdelicacies.com. Do you have any idols in the baking world? I admire Julia Child, she was the queen of French cooking and baking in the US. The enthusiasm she had around food and her passion was enough to convince hundred and thousands of people to try and start cooking. She made it look so fun and easy. The last thing I made were vegan and gluten-free waffles, which I make every Saturday and sell at Soho Vegan Market. They are deliciously light and fluffy making them the perfect breakfast or afternoon treat. Favorite places in London/France for baked goods? I love going to Deliciously Ella’s deli in Bond Street, away from the hustle and bustle of the city. Café Forty One who has just opened in London makes delicious vegan pastries. If the weather allows you, choose a table outside, the setting is perfect in summer for an afternoon tea, reading your book in the shade of a tree. In Paris I love VG Patisseries for the most exquisite vegan croissants. You can find me every Saturday at Soho Vegan Market for the most delicious vegan and gluten-free waffles and tartlets with vegan Nutella. Baking is my favourite thing to do to relax and unwind. Going out for a walk in the park, being by the seaside, listening to a podcast and reading a book are also at the top of the list. What is the best part of the process of baking? I always heard that when baking you need to be precise with quantities and follow some rules, but if I am honest with you a lot of my recipes are the results of improvisation. Now I have to be precise for my readers so I write down everything. But that’s what I love, putting all the ingredients together and improvise by mixing in new things. In a large bowl, stir together the rice flour, coconut flour, cane sugar and salt. Next add the coconut cream and coconut oil and keep stirring until smooth. It should make a thick and smooth batter. 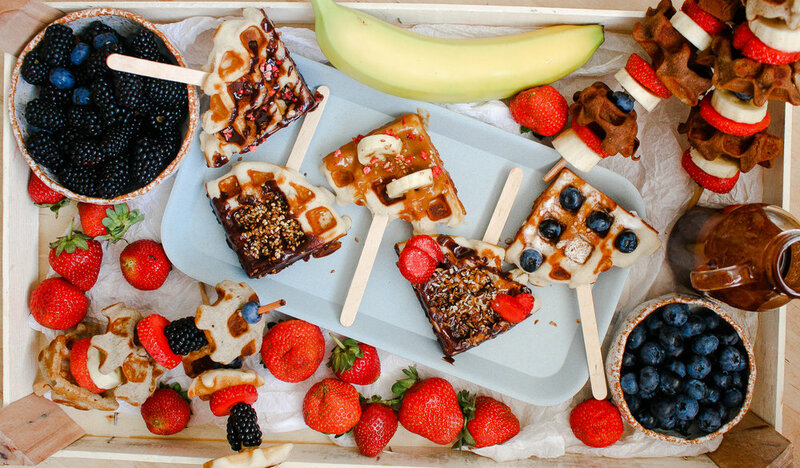 Spoon the batter into a ladle and pour onto your hot waffle maker, spreading it all over before closing it and letting cook for 3 to 4 minutes. Grease a loaf pan and preheat your oven to 180°C. Cover the chia seeds with water and let them sit for about 5 minutes. In a large bowl whisk together the dry ingredients except for the cocoa which will be added later. Divide the mixture into 2 equal portions and place in 2 different bowls. Flavour the 1st bowl with the vanilla extract. In the 2nd bowl, add the cocoa, coffee and remaining maple syrup (30g) and mix. Pour the 2 mixtures into your loaf pan alternating between the vanilla mixture and the coffee/chocolate mixture. Next, insert a skewer or the end of a spoon into the batter and create big swirls all over the cake being careful not to overmix. Place in the oven and bake for about 35 minutes or until golden. A skewer should come out clean. Take the cake out of the oven and cool on a wire rack for 10 minutes. Remove from the pan and wait some more until completely cool, then slice it and check out if you got the marble effect! *gives texture and elasticity to gluten-free cakes. For more of Mimie's incredible bakes, check her out on Instagram and at Mimie's Delicacies.